Howard Vineyard is a picturesque winery located just outside of Mt Barker. With beautifully manicured gardens and a rustic stone barn housing their charismatic cellar door, the Howard vineyard offers unique experiences for any guest. 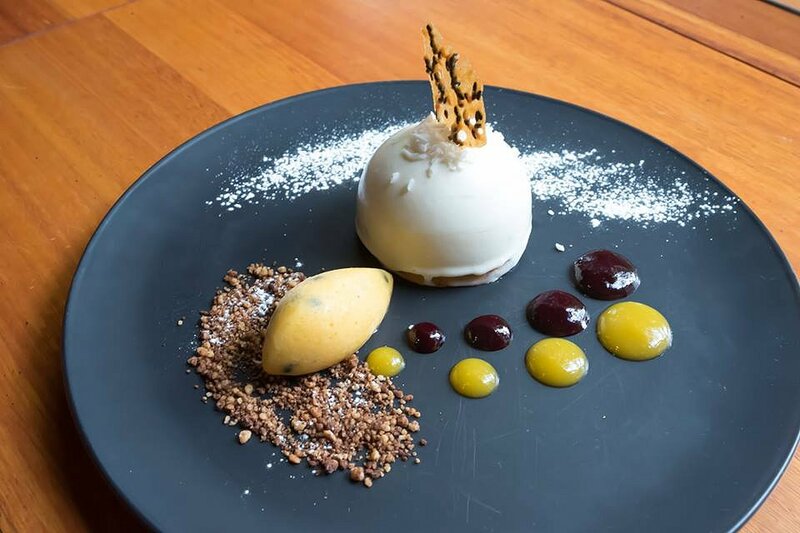 After some renovations they recently unveiled their new Cellar Door and Restaurant space, accompanied by a new Spring Menu Launch, showcasing the best ingredients from their very own garden and locally sourced produce. With beautiful hospitality and a wonderful atmosphere, the spring menu launch was a wonderful event where guests were able to immerse themselves in nature and enjoy the wonderful food and the relaxing atmosphere. 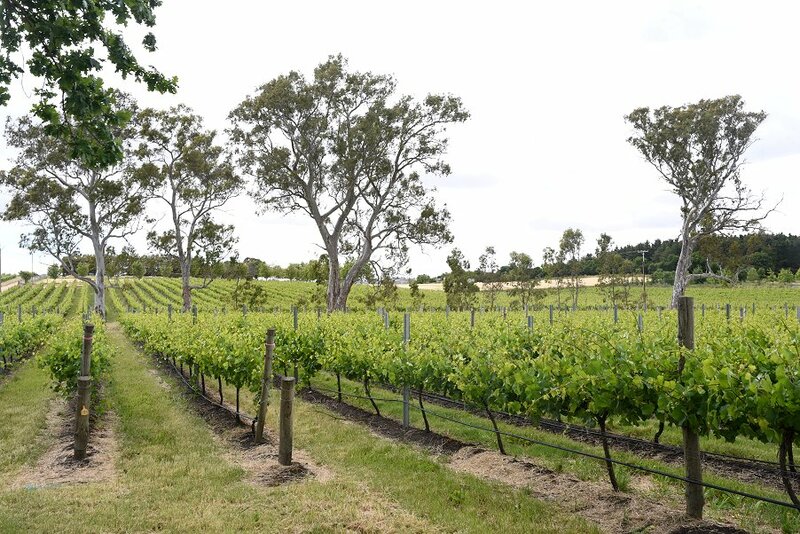 We first visited the Schoenthal Vineyard situated near Lobethal, where Howard Vineyard grows all of their grapes for their sparking and white wines due to the cooler environment. Head wine maker, Tom Northcott, welcomed us to the vineyard, showcasing what they have been working on and gave a bit of behind-the-scenes insight in to Howard Vineyard. “It is our twenty-first vintage this year, so it’s a nice little celebration today,” he said. Howard’s Schoenthal Vineyard is also one of the major grape supplies to Shaw and Smith, Bird in Hand, and a number of smaller wineries around the area. “We have re-branded our entire folio of wines now, to really freshen them up and we’ve changed the wine styles; we have a brand new cellar door and a very new chef with a brand new menu that we can’t wait to share,” Northcott said. We were then taken to the Cellar Door, and Clover and Stone Restaurant at Howard Vineyard located in Nairne, where Marketing Manager, Amber Flavell, invited us to enjoy the day at their beautiful winery. Amber also welcomed us to the launch of their new modern Australian-Asian themed five course set menu, just in time for spring. “Our weekday menu will be a shortened menu of what we have today,” Flavell said. 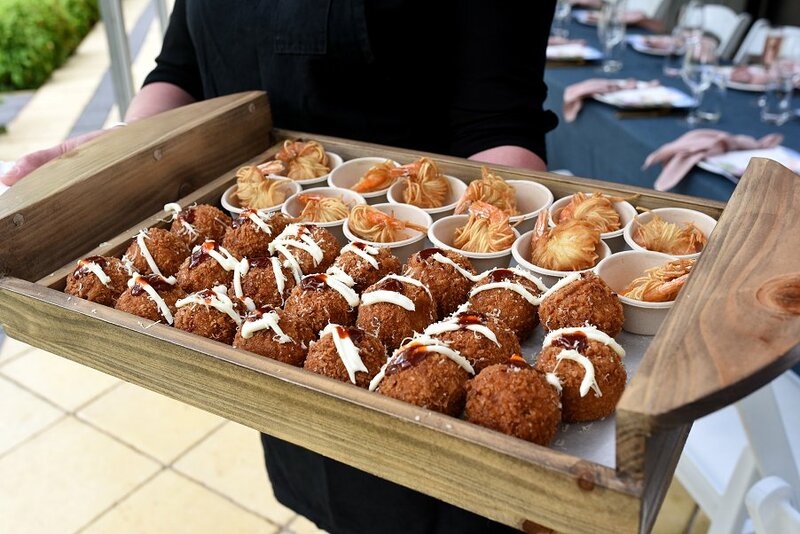 Canapés of Korean Spiced Vegetable Arancini, Korean Kimchi Prawns and Curry Croquettes were handed out while we waited to take our seats for the main menu launch. Seared Salmon Tataki with wasabi mayo was beautiful in presentation and tasted just as amazing. We ay first didn’t want to touch it as we would ruin the plating but of course, temptation got the better of us and we dived right in. The wasabi mayo had a slight sweetness to it with the added peppery heat but just enough to get the taste and not burn your mouth. The salmon was beautiful and fresh and definitely the hero of the dish, with a lovely, slightly seared outer. The salmon was not too fishy in taste and just showcased it’s lovely natural flavours. 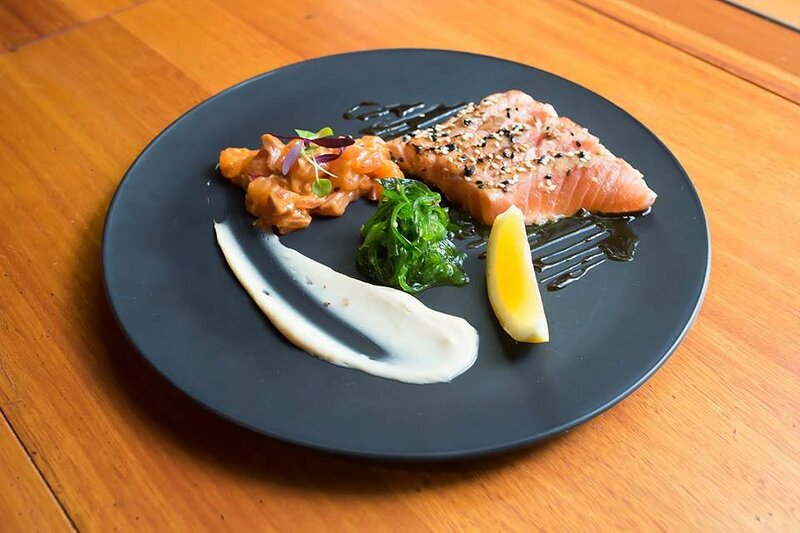 The sea salt flavour balanced well with the more savoury tang from the seaweed salad, which paired perfectly with the warm spices added into the cubed salmon salad. Crispy Pork and Kimchi Dumpling with yuzu ponzu sauce again had a beautiful presentation and smelled amazing. The dumplings were of generous size and had a lovely meaty centre. The pork was cooked well and was very juicy. The pork was also covered in a slight spice that warmed the mouth but didn’t leave you wanting water. The crisp cabbage that the dumplings rested on was a lovely textural element and paired well with the spices. The crispy dumpling skin was delicious and had a slight chewiness underneath. The yuzu ponzu sauce was lovely and the hint of the citrus base added another level of freshness to the dish and helped balance the sweeter and savoury flavours. Beef Salad with Vietnamese bun-cha dressing was delicious. This Asian styled dish is one that I would love to be able to cook at home to eat whenever I wanted. The meat was cooked perfectly and was lovely and tender and juicy. The contrast of the warm meat and cool salad components was lovely. The beef marinade held sweet deep flavours that paired well with the sweeter tangy dressing for the salad. 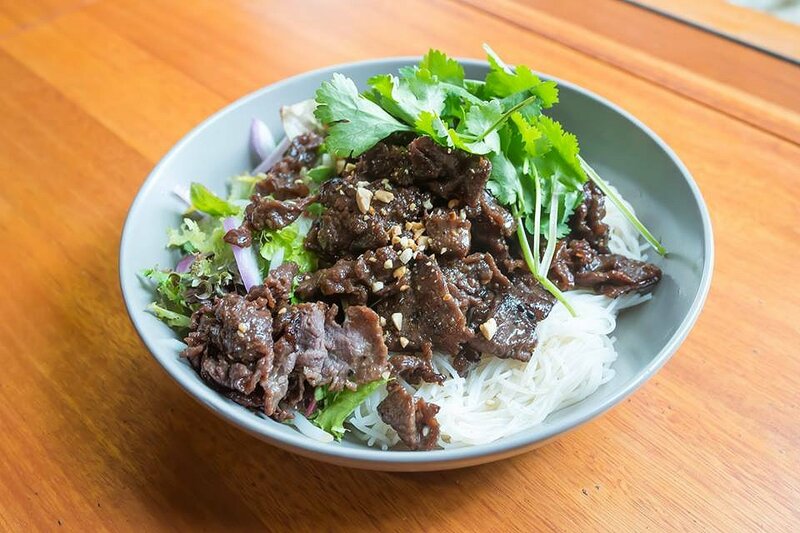 The salad had a lot of beautiful balancing textures with the soft noodles, crunchy salad and tender beef. Perfect balance of flavours and texture with a lovely crunch of peanuts on top giving another flavour dimension. The beef was also thinly sliced, which was perfect for the salad. Overall a lovely dish and if I had to express my thoughts in one word, it would be: Yum! 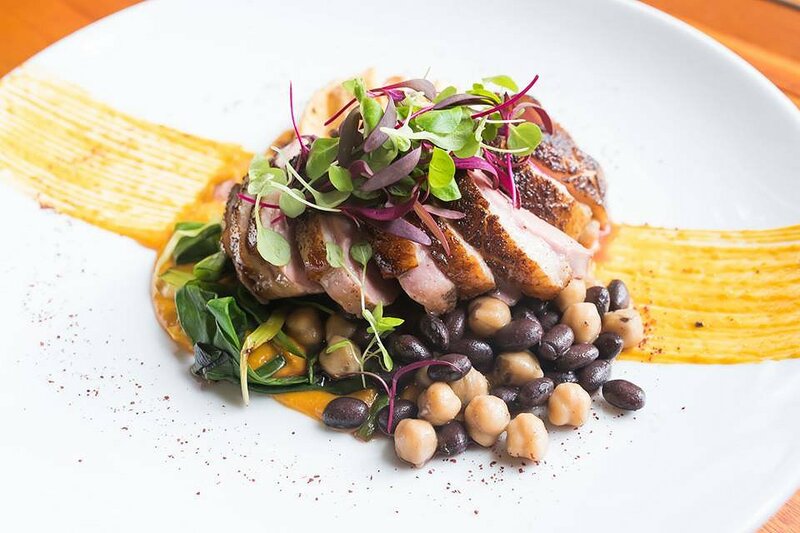 Tea Smoked Duck with chickpea and black bean was another lovely dish. The presentation was beautiful and the smokiness of the duck was a lovely prominent flavour where I could definitely taste the tea. Even though the smoke was quite a strong flavour, it was definitely the hero of the dish, and not an overpowering flavour. The duck was cooked perfectly, beautiful and pink in colour with lovely, tender meat. The crispy outer skin of the potato was a lovely textural balance with its soft centre. The spices on the potato skin balanced well with the smoky duck and the spring onions, which added a level of freshness and tang. The chickpea and black bean added smoothness and lovely earthy tones to the dish, which paired well with the smoke. I’m usually not a huge fan of the strong black bean flavour but I quite enjoyed this, as it wasn’t too overpowering and balanced well with the other components in the dish. The salty and slightly crispy skin on the duck was delicious and the whole dish sat on a sweeter pumpkin puree that tied the dish together. Coconut, Mango and Passionfruit Petit Cake was stunning to look at. This was another dish I just didn’t want to touch and ruin the presentation. Thee tangy, tart passionfruit sorbet was delicious and gave a lovely textural balance with the crunch of the passionfruit seeds and the soft sweet biscuit crumb it sat upon. A crisp sesame seed tuile sat on top of the petit cake, which added a lovely crunchy texture and deeper savoury tones to the otherwise sweet dish. The sweet, smooth and creamy mouse/cheesecake like cake was sweet but not super sugary, utilising the more natural sweetness of the fruit. There was a nice balance between the fruits; the mango, coconut and passionfruit all paired nicely and didn’t overpower one another. 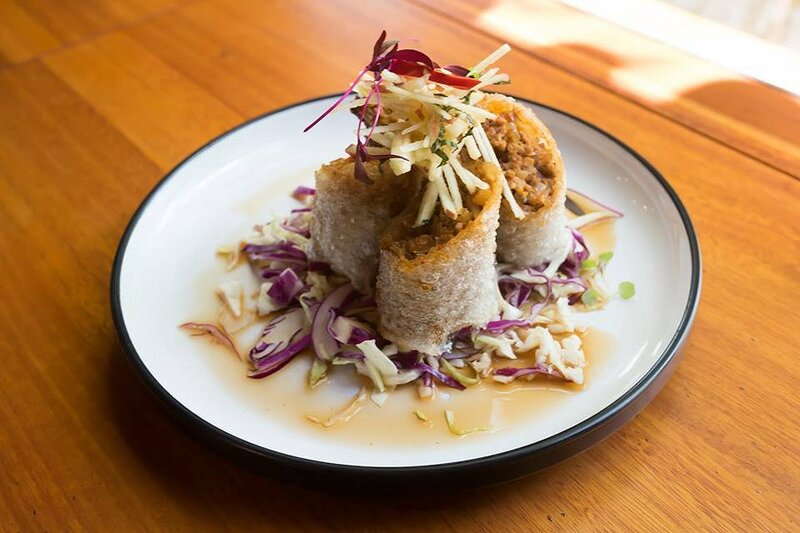 The sharper coconut flavour from the shaves on top added a level of lightness to the dish. The cake had a lovely thin biscuit base too, which added a perfect textural balance to the smooth components of the cake. The sweet mango and raspberry coulis completed the dish, adding sweet tarty flavours that balanced with the sweet and creamy mouse. The staff at Howard Vineyard helped make all guests feel comfortable and catered for everyone’s needs, bringing out vegetarian and gluten free options for those with different dietary requirements. The whole experience was wonderful; the tours around the vineyards and the delicious new menu, was just a taste of what Howard Vineyard has to offer. 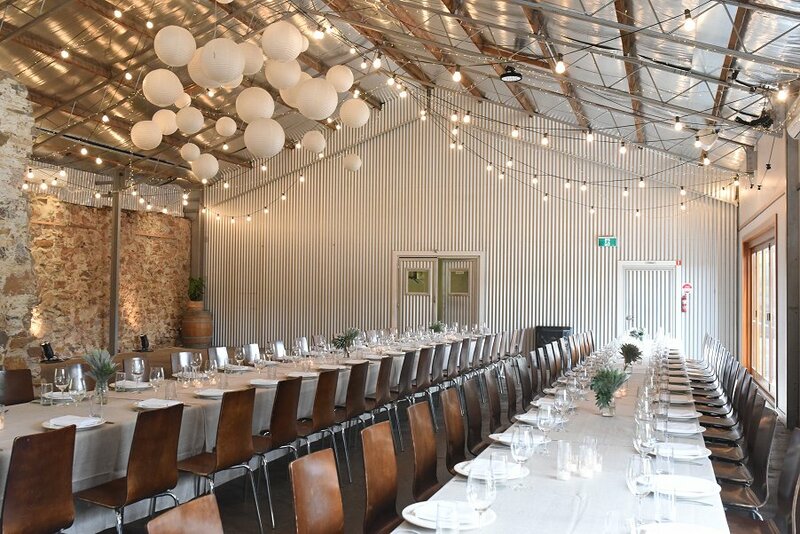 While we enjoyed a lovely formal dining experience with live music, Howard Vineyard also invites guests to come have a more casual or fine dining experience, relax with the views or even to just come cosy up by the fire at the new Cellar Door; I guarantee there is something for everyone. And with a menu that is updated every season, I am looking forward to returning and tasting what new food they will have for summer.